7.2 Diplomatic Series - President Aliyev Visits the U.S.
President Aliyev Visits the U.S.
President Heydar Aliyev was in Washington, D.C. to attend the 50th Anniversary of NATO from April 22-24, 1999. During his visit, he discussed various issues. Here are edited remarks that he made on three occasions on April 26 at the Center of Strategic International Studies, the banquet of the U.S.-Azerbaijan Chamber of Commerce and with the Editorial Board of the Washington Post. It goes without saying that the Kosovo problem is a very complicated one. But we in Azerbaijan have been living with a similar problem for the last decade. Beginning in 1988, Armenia tried to seize part of Azerbaijan (namely Nagorno-Karabakh) and unite it with its own territory. As a result, war broke out. Armenia's armed forces managed to occupy about 20 percent of Azerbaijan's land. To stop their aggression, we signed a cease-fire agreement five years ago [May 1994]. 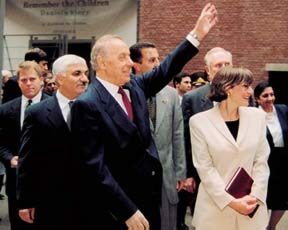 Photo: President Heydar Aliyev visiting the Holocaust Museum in Washington, D.C., April 1999. Photo: Bagirov. We would like to achieve a peaceful settlement. We are ready to grant the highest degree of autonomy to Nagorno-Karabakh within the Republic of Azerbaijan but the Armenian side does not agree to this arrangement and, therefore, the issue remains unresolved. In Yugoslavia, the war began when Kosovar Albanians tried to claim self-rule for themselves because Milosovic had carried ethnic cleansing in that region. We consider his action to be criminal. Our position is that the territorial integrity of each country and each nation should not be violated. Therefore, we support the territorial integrity of Yugoslavia. We are against separatism. At the same time, we are against ethnic cleansing and against genocide. It goes without saying that we are against granting independence to Kosovo-Albania. At the same time, we are against the violation of the rights of the people of Kosovo. We believe that the best solution would be to ensure the territorial integrity of all Yugoslavia, but extend autonomy to Albanians of Kosovo within Yugoslavia. Both sides should be compelled to put an end to the conflict based on these principles. Well, if Armenia would agree to accept the highest status of authority, then we can negotiate the details. As for the example that you mentioned of the people of Nagorno-Karabakh having their own police force, of course, we would agree to give them the right to have their own police force and carry guns to ensure the security of the local people in Nagorno-Karabakh. You mentioned a land bridge to Armenia, we absolutely have agreed to that-to allow a bridge to link Nagorno-Karabakh to Armenia. 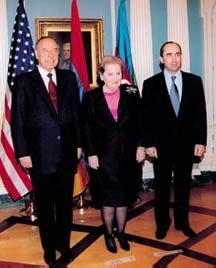 Photo: President Aliyev with U.S. Secretary of State Albright and Armenian President Kocharian in Washington on April 26, 1999. Photo: Bagirov. We are also prepared to extend enormous power in economics. We are prepared to allow them to broaden their authority and establish direct economic relations with foreign countries. When I say the highest degree of authority, there are only a few areas in which they have to be subordinate to Azerbaijani authority. As to the majority of issues, we would be willing to give them full freedom and authority. There are many similar autonomous countries throughout the world. We are ready to grant Armenia the highest standards of autonomy that exist in other parts of the world. But, undoubtedly, we need to talk and negotiate the details with them. But I would say this is almost equivalent to extending independence to Nagorno-Karabakh. But Armenia does not agree to this arrangement. There are about 30 million Azerbaijanis who live in Iran and who comprise nearly half of the total population of Iran. But as a nationality, these Azerbaijanis are completely deprived of their national rights. The Iranian regime is very sensitive about this issue. But why should that be-if all these Azerbaijanis want is to have the right to attend schools in their own language and be able to publish newspapers and books in their own language? They don't want anything else. But the regime will not grant them these rights. During his presidential campaign, the current President of Iran promised that if he were elected, he would grant those rights to the Azeri population of Iran, based upon Article 15 of the Iranian Constitution. But he has not carried out his promise. These processes are underway in Iran, but the regime relies heavily on religion and police force. GUUAM. New alliance among the former Soviet Republics composed of Georgia, Uzbekistan, Ukraine, Azerbaijan and Moldova. Presidents from GUAAM nations gathered in Washington for NATO's 50th Anniversary in April. 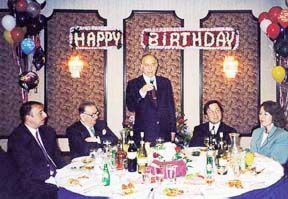 (l-r) Heydar Aliyev (Azerbaijan), Eduarde Shevardnadze (Georgia), Betru Luchinski (Moldova), Leonid Kuchma (Ukraine) and Islam Karimov (Uzbekistan). Photo: Bagirov. About two weeks ago, I received letters from President Clinton and Secretary of State Madeleine Albright emphasizing their intention to become more seriously involved in bringing about a peaceful settlement to the Nagorno- Karabakh conflict. According to their statements, the Administration has been trying and will continue to make every effort to have Section 907 repealed. Today [April 26] I will have a meeting with Madame Albright. Definitely, we will discuss this subject during that meeting as well. This is one of the most illustrative examples of injustice in the world. It is unfortunate that we have been the targets of this injustice. We have been trying for several years now to get Section 907 repealed. This legislation, which denies direct aid tothe Azerbaijani government, was passed in 1992 and drawn up as if Azerbaijan were the aggressor [in the Azerbaijan-Armenian conflict]. But, in fact, it is Armenia that has occupied 20 percent of Azerbaijan. It is Armenia who currently occupies a major part of the land on which lies the railroad that connects Baku with Yerevan [the blockade for which Armenians blame Azerbaijan]. It is they who have restricted our capabilities. But in the U.S., everything is viewed vice versa. I would say, instead of punishing Armenia, the U.S. is punishing Azerbaijan. All these things deeply sadden and disappoint us because we look to the United States as being the most democratic nation in the world. It is simply unimaginable to us that such injustice continues. Above all else, I want to be very frank with you. From the moral point of view, we cannot tolerate this injustice in Azerbaijan anymore. I don't think Azerbaijan deserves this injustice and I hope that the U.S. Congress will finally manage to repeal it. The reserves in the Caspian are even more than what was announced four years ago. When we signed the first contract in September 1994, which we termed "The Contract of the Century," I could never have imagined that after four years, our country would have signed 16 contracts. Tomorrow, here in Washington, we are going to sign three more contracts - Exxon, Mobil and Moncrief. If there were less oil reserves in Azerbaijan, do you think that these companies that originally signed up with us would still be inclined to sign additional oil contracts? To date, 42 companies representing 14 countries have signed 16 contracts. With tomorrow's signing, the total investments in Azerbaijan's oil sector will be $50 billion. The estimates indicate that the energy reserves in the Azerbaijani sector of the Caspian Sea are somewhere between 4 to 10 billion tons. That was our early estimate. In reality, the reserves are even greater. For example, we planned to produce 510 million tons of oil [from the AIOC contract]. But now we see that we will be producing 630 million tons. In other words, 120 million tons more oil just from that first contract. We were expecting to produce 500 tons per day from each well, but now we are producing about 2,000 tons per well per day. The articles you read in the Western media and the U.S. press about reduced reserves originate from sources that oppose Azerbaijan's oil strategy, including pro-Armenian forces. For example, we know that Russia is against Azerbaijan's oil strategy, specifically, against Western and American involvement in the Caspian region. Therefore, they spread various rumors as you have mentioned. There are no grounds for these rumors. The Caspian Sea has an enormous amount of oil reserves, not only in the Azerbaijan sector but in other sectors as well, especially in Kazakhstan. This is an issue that is currently being widely discussed. AIOC has estimated the total cost of this route between Baku and Jeyhan (Turkey) via Georgia to be $3.7 billion. From an economic point of view, this was not feasible. However, Turkey has made its own calculations and concluded that only $2.4 billion is needed for its construction. If this pipeline can actually be constructed for that amount, AIOC will have no objection in building it. So the total costs for all aspects of this pipeline are being worked out. The issue of tariffs will be worked out later. Turkey has promised that they will ensure all conditions to make the Baku-Jeyhan route a reality. Azerbaijan is not the only one involved in constructing these pipelines. In other words, we are constructing these pipelines in joint cooperation with Western energy companies who are active in Azerbaijan. For example, both pipelines-the Northern route [via Russia] and the Western route [via Georgia]-have been constructed by the AIOC consortium (Azerbaijan International Operating Company), which is composed of 11 companies. The Supsa pipeline (which involved $590 million in investment) belongs not only to Azerbaijan, but to these oil companies as well. Together, we have been taking measures to guarantee their security. We favor the export of Turkmen gas via the Transcaspian pipeline from Azerbaijan to Turkey. Turkmenistan and Azerbaijan are both in agreement about this. Turkmenistan's President has appealed to me requesting my support for exporting Turkmen gas via Azerbaijan to Turkey. I promised my support for this proposal, and we have had numerous telephone conversations. There is no problem concerning it. I have received representatives of American oil companies who are involved in the construction of this Transcaspian pipeline and I have promised Azerbaijan's support. I think this issue, in reality, is already settled. There have always been critics. If everyone were to agree all the time about an issue, it would mean that that thing has no value. But there are two types of critics: critics who are just in their appraisal and critics who are biased. In regard to the elections, the majority of those critics were biased and because of that, I did not pay attention to them. Well, there is pluralism in Azerbaijan and people who suggest that he should become President can say whatever they think. I don't have to comment on every view. Various discussions are underway among the opposition about the son of Heydar Aliyev. But just like them, Ilham Aliyev has the right to elect and to be elected. As a citizen of the Republic of Azerbaijan, he can enjoy his rights and use them whenever he wants. He is absolutely independent in this issue. You ask whether I would vote for him. Do you think that I wouldn't? If I told you "no", you wouldn't believe me. Russia is a major power. They are our neighbors to the North. We have always been desirous of having positive relations with them. Russia is also one of the Co-chairs [along with the U.S. and France] of the Minsk Group, the Committee within the Organization on Security and Cooperation of Europe (OSCE) commissioned to bring about a peaceful settlement to the conflict between Armenia and Azerbaijan]. Therefore, we have always been desirous of seeing Russia carry out this mission. Unfortunately, this has not yet been achieved, either in terms of Russia's role or that of the U.S. or France which are also co-chairs on this committee. Given that Armenia is in conflict with Azerbaijan, we are concerned that Russia fosters special relations with Armenia. I'm sure you are aware that we learned in early 1997 that Russia had illegally supplied Armenia with weapons worth $1 billion during the previous three years. Several times we appealed to the leadership of Russia to stop these illegal shipments and to have them withdrawn to Russia, but we have not achieved any results. Russia maintains military bases in Armenia which carry the status of Russia's own military bases, since Russia has signed a military alliance with Armenia. These past months, Russia has again been supplying new weapons to Armenia, namely S300 missiles and modern MIG 29 fighters. These supplies threaten the stability and security of the Caucasus. We are very concerned about this and have protested vehemently against Russia's activities both in the form of an official statement and an official letter that I have sent to President Yeltsin. Furthermore, at the CIS Summit in Moscow on April 2, I made an official statement regarding Russia's illegal shipments of arms and weapons to Armenia and expressed our dissatisfaction. It is obvious that these relations harm Russia's role in OSCE's Minsk Group in being able to broker a peaceful solution to our conflict. On the contrary, their activities jeopardize peace and stability in the Caucasus. In regard to our protests about their military bases in Armenia, Russia's response has been to say that this military build-up is not against Azerbaijan but that it is intended against NATO. We consider Russia's position to be unwise and wrong for the Caucasus. You can see for yourself how closely Russia is tied to Armenia. 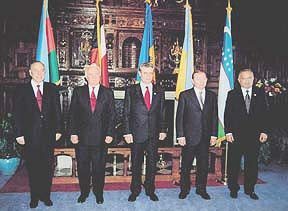 On April 2, 1999 at the CIS summit in Moscow, the issue of prolonging the Collective Security Treaty among the CIS countries was one of the main issues on the agenda. Five countries did not approve the treaty-Azerbaijan, Georgia, Uzbekistan, Ukraine and Moldova. Thus, only six countries remain within the framework of the CIS Collective Security Treaty. They include Russia, Belarus, Kazakhstan, Kyrgyzstan, Tajikistan and Armenia. The CIS has not been able to become a formal active organization since the collapse of the Soviet Union. Their ineffectiveness is quite obvious. As to what will happen in the future, we'll have to wait and see. That's a very complicated question. Let me not comment. Let me not answer that question. . . I don't wish to talk about personalities. Obviously, Russia tries to exert pressure. Simply, they lack the financial resources to be involved in the development of the Azerbaijan sector of the Caspian Sea. Their desire, their dream is that Azerbaijan should hold onto its reserves and not develop them, waiting for the day that Russia will have the capability to do that. Therefore, they try to exert pressure through various means, including attempts at coup d'etat starting from 1994. For example, we signed the "Contract of the Century" on September 20, 1994. On September 29, Azerbaijan's Speaker of Parliament and a very high-ranking military official were assassinated by terrorists. And then again, another threat came later when four very dangerous criminals "escaped" from prison and were taken to Russia. Again, we managed to thwart another coup attempt in October 1994, and later in March 1995. In the autumn of 1995, an attempt was made to shoot down the Presidential plane while I was on an official visit to Bulgaria and Romania. We know very well that Russian intelligence played a unique role in this situation. The goal was to assassinate the President of Azerbaijan or to push him from power militarily and thus facilitate change in Azerbaijan's policy. In regard to what you refer to as the "swinging pendulum" of Russian nationalism, I try to refrain from making predictions. I don't forecast the future. However, the internal processes in Russia are very dangerous, especially as their chauvinistic and nationalistic forces become stronger. One needs to be very careful. As you say, some analysts would suggest that a weak Russia is more dangerous to its neighbors than a strong Russia. These are very serious issues to consider. All I can say is that we desire to see Russia as a democratic nation. We don't want Russia to be ruled by nationalistic and chauvinistic tendencies. We want to see Russia based on democratic values and principles that are universally accepted. We hope that the attempts to rebuild the Russian empire will fail. We want Russia to become a peace-loving country and to have a peaceful and just attitude towards its neighbors, especially its neighbors in the South Caucasus.